By default, Microsoft Outlook will prevent you from opening certain file attachments that can damage your computer, by containing malware code. However, sometimes you need to be able to handle these attachments (for example Word or Excel files). For example, if you want to be able to receive and open EXE files, simply select the EXE extension from the attachment extensions list and click on the "Remove" button. For security reasons, you can password protect this list, so only you can decide which attachments to trust and which to block. To enable the password protection, simply mark the checkbox "Password protect attachment blocking list" then insert your desired password. Next time when you will want to alter the list, you will be asked to input the password firstly. 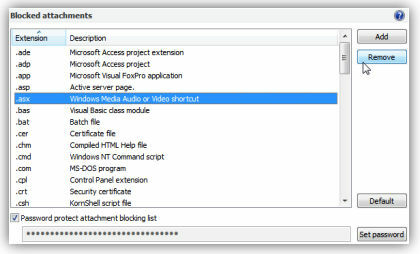 If a file extensions was added/removed from the list, you will have to restart Outlook for the changes to take effect. Here is list of attachment file extensions considered unsafe by Outlook.